Ever wonder what your dog is up to while you’re away from home? Does he spend most of the day sleeping? Is he getting enough exercise? Is he sick? Unfortunately, your dog can’t call or text you to let you know when something is wrong. But a new device called Whistle can – it’s a complete activity monitor, much like the FitBit, designed specially for man’s best friend. Whistle itself is a tiny, light-weight metallic disk that attaches to your dog’s collar. It uses a built-in accelerometer to determine whether your pet is asleep, out for a walk, and even when your pet decides to take an jump into the pool on a hot day. All the data is recorded and viewable using an included iPhone app. 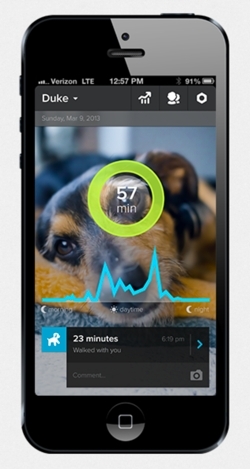 Whistle tracks your pet’s long-term activity trends and compares them to the average for other dogs, so you can know at a glance whether Fido needs more exercise. You can share this data with friends or your vet, who may be able to diagnose serious problems with your pet based on changes in its behavior. The device itself comes equipped with a 10-day battery, so Whistle will spend far more time on your dog's collar than on a charger. And don’t worry if it starts to rain or if your dog goes for a swim – Whistle is waterproof. The blog was very helpful in signifying the aspects of pet care. Cheers!